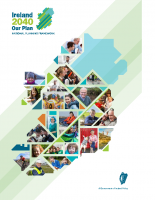 The Government has published the draft of the National Planning Framwork “Ireland 2040 – Our Plan” today. The final round of public consultations on the document will last until 3rd November 2017. The main objective of the Plan is to guide planning activities on a local, regional and national level to ensure sound investment decisions, opportunities for sustainable economic development are maximised and that Irish public authorities at all levels cooperate in achieving this goal. The long-term strategic document, prepared by the Department of Housing, Planning and Local Government, aims to prepare our country for future challenges linked to ever increasing competition for investment, growing demand for services, with a predicted population of around 5.8 million in 2040 and combating climate change. The context for future infrastructural investment.